Recently, American Miniaturist magazine asked some of our 2016 Creatin’ Contest winners to share their projects’ stories. The resulting feature articles appear in the current issue and will roll out for several months to come, so please check them out. While reading over this month’s issue, I noticed the stories often mention the crafters’ favorite tools and realized my own favorites are so important to me that I’ve asked for some of them to be included in the HBS catalog and on the website, so you can find them easily, too. I do a lot of different things here: You see the catalog cover scenes and room vignettes, and the finished Creatin’ Contest kit each year, but there’s plenty more. Sometimes a sample will need to be repaired before it can be photographed. There are little one-off projects, such as modifying a Houseworks door for a completely different look, or testing new glues. Sometimes the item we’ll sell is a kit, but we need to show you a finished example. I use plenty of the tools you’re probably familiar with, but I also rely on a few you may not know and use others in ways you might not have thought about. 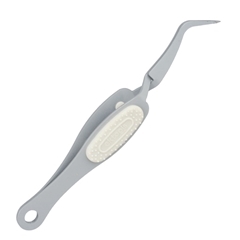 An essential tool with a cumbersome name: #54400 Reverse-Action Tweezers. Awkward though it is, the name tells the story: You squeeze to open the jaws and their design closes them when you release. They take a bit of getting used to but once you have you won’t want to go back. Of course you can pick up and position tiny things, but you don’t have to apply pressure to hold the tiny thing as you do. They can hold something teeny for painting or gluing, or even act as a clamp while glue dries. You can set them down and move away to other things. They save time, effort and aggravation. That’s a good tool. Next is #62111 Curved Hemostat: A scary medical name but the absolute best tool for changing plugs on lighting fixtures (and other tasks). You know what I mean, the lamp goes inside the room but the power strip is outside so you take off the plug and feed the wire through a tiny hole . . . but then you have to put the plug back on. This is the tool for the job. 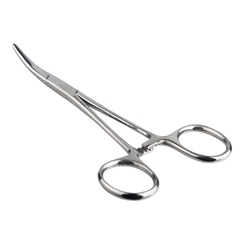 A hemostat is essentially a clamping needle-nose plier. For this job, use the hemostat to pull out the brass pins and carefully set them aside. Pull the wire out of the plug and straighten it to go through the wall. (Tip: If you need to cut a clean end, cut on a diagonal.) Feed the wire back through the center hole of the plug, split and use your fingernails to strip the wire if you had cut it, twist the fine strands of each side together and bend the wire to insert the bare copper into one side of the plug. (#54400 Reverse-Action Tweezers are helpful here.) Clamp a brass pin in the hemostat and push it into the plug to hold the wire. Repeat for the other side, pull the main wire back away from the pins and you’re done. That’s just one use; there are so many more. Number three on my list is the amazingly versatile craft knife. There are lots of craft knives available, and easy to find, but the main reason I like this one – which will be on the website and in the catalog soon – is the design feature that improves safety of use. The blade locking mechanism is at the end of the handle, away from the blade. You know you should always work with a sharp blade. It may seem counterintuitive, but you are much less likely to cut yourself if the blade is sharp, because your task will require less pressure, and it is when pressure is applied that knives can slip. Most other knives have the chuck release very close to the blade. Sometimes the chuck sticks and won’t release the blade, which requires more pressure to remove, which increases the chance it will slip, which increases . . . well, you know. In testing this knife, the chuck sometimes had the same problem but, instead of wrestling with it at the business end, a simple rap of the loosened end knob on a hard surface freed everything up. I could go on: safety cap, non-slip grip, non-roll feature, accepts all standard blades, made in the USA . . . just pick your own reason and give it a try. 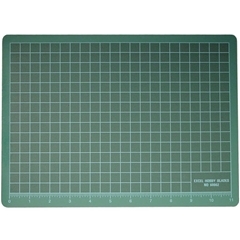 A craft knife’s natural partner is the Self-Healing Cutting Mat, #600021. I was a crafter before these came along and can certainly attest that they changed the game. Most of us don’t have dedicated, ideal crafting spaces (dining room table, anyone?) but even when we do, we know it’s wise to protect our work surfaces so they can serve for years to come. Less well known is that, in addition to protecting what’s underneath, cutting mats help keep knives sharp longer. Everything you cut dulls your knife, but a cutting mat helps preserve the edge so you need to change blades less often. If you don’t have one, please give it a try. If you do have one, get another. I use several, in various sizes, since different projects need different amounts of space dedicated to cutting. This is a nice, medium size that works well with a standard 12” non-slip steel ruler (you should have one of those, too). Last for this list, and maybe a headscratcher for you, is a palette knife. This tool is designed for artists’ use in mixing oil or acrylic paints on a palette, and is sometimes used as the painting tool, instead of a brush. I use mine for all of those things, but so much more. Did you ever use a spackle-type product for filling cracks in a dollhouse? Palette knife. Did you ever apply mortar to bricks or tiles and need to finish the joints? Palette knife again. I also use mine for opening blister packaging (pry under the edge), removing staples, scraping away dried glue or paint where it isn’t wanted (but be careful, it is a knife and can cut), prying apart things that became glued together accidentally . . . (OK, maybe that’s just me). Point being, it’s a useful tool you might not think of. Ours will be online and in the catalog soon. As mentioned above, the Craft Knife and Palette Knife are both being added to the Builders Corner Handtools section as soon as we can get them on the shelf. If you would like to be notified by email when they become available, please send a quick note to us at hbs@miniatures.com. Hope your summer plans leave plenty of time for minis!